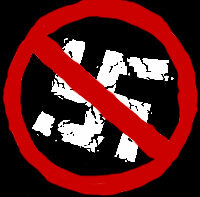 Stop The Latvia Nazi State of EU and NATO!!! On March 16, 2008, a Waffen SS demonstration took place in the capital of a state that recently became a member of the European Union and NATO: Latvia and its going on every year. Authorities decided to allow it and to repress the citizens who protested. Far from being an isolated action, this event represents the culmination of a process, which aims at denying the disappearance of Nazism and rehabilitating it, led by the president of the Republic, Vaira Vike-Freiberga and openly financed by the Embassy of the United States. It takes place after Nazi parties have assumed power in different “democratized” states like, for instance, Ukraine. The events of March 16, 2008, in Riga (Latvia, Baltic State) have inflamed the feelings in Eastern Europe and Russia but it is very unlikely that the Atlantist press (that of western Europe and the European community) will make any reference to them. Actually, the facts speak for themselves and reflect an inadmissible aspect of NATO and the European Union since its expansion on May 1, 2004.